The name of Jatiuwih comes from 2 Balinese words jati + luwih. Jati means real, and luwih means beautiful or excellent. 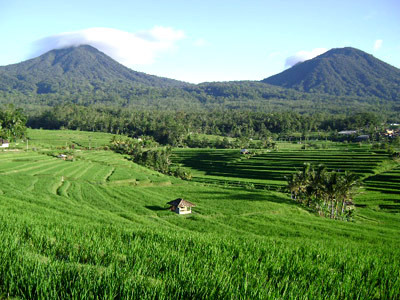 This name is given to the vast stretch of rice field dug in terraces on the slope of mount Batukaru. The rice terrace forms beautiful sight at all seasons, during the watering, or before planting the rice looks like a tremendous construction big glass with irregular size of frames. When the rice almost reaches harvest time, often the color varied between green, and dark yellow. This mixture of color forms a breathtaking views on such as wide view over the terraces which border is very far away down there. Road that cut the rice terrace near the top border is a good place to enjoy this man made natural scenery, and at one of the high place has been built a hall by the villagers where local people can open small restaurant or selling snacks to the visitors. From here is the best point to enjoy the view which location is almost in the middle of the road from the west border and east border of the rice field. At the west border is the original village of Jatiluwih with some still traditional houses made of red clay, and some stall selling rice. In the east border there are a restaurant and stable where one can hire a horse to explore the area or arrange a trekking to mount Batukaru higher slope of even to the peak. Further up from the rice terrace near the border to the forest there is a waterfall around 25 meters with natural clean water arising a strong wind up to 10 meters from the fall. This water source is still further up the slope around 300 meters which is not too steep. At the back ground of Jatiluwih rice terrace is Mount Batukaru, the second highest peak in Bali after Mount Agung or 2671 meters above sea level. The same as Gunung Agung Gunung Batukaru also has big temple on its southern slope, but Gunung Agung does not have a temple on the top of the mountain like Batukaru. During the ceremony at the temple on the slope of the mountain people also hike up to the top to perform the ceremony at the top of the mountain. It takes around 5 hours to trek from temple below to the temple at the top of the mountain. 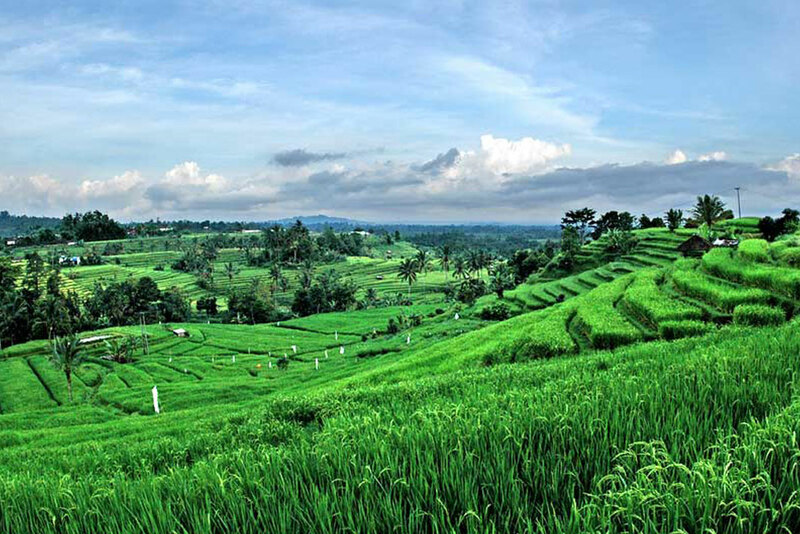 Jatiluwih rice terrace has been the most popular visit for a tour itinerary combining a sightseeing to the center and west of Bali. A popular trip visiting Jatiluwih is called Bedugul Jatiluwith tour which is started to stop at Taman Ayun Temple, then continue to Bedugul mountain resort with it's interesting places such as Ulun Danu temple, Botanical garden, and fruit market, then continue the trip to Jatiluwith through the beautiful country sides via Baturiti town. After Jatiluwih rice terrace one can continue or not to the Temple of Batukaru. If it is continued then a combination to visit Tanah Lot will give good time, since Tanah Lot temple is beautiful during the sunset.